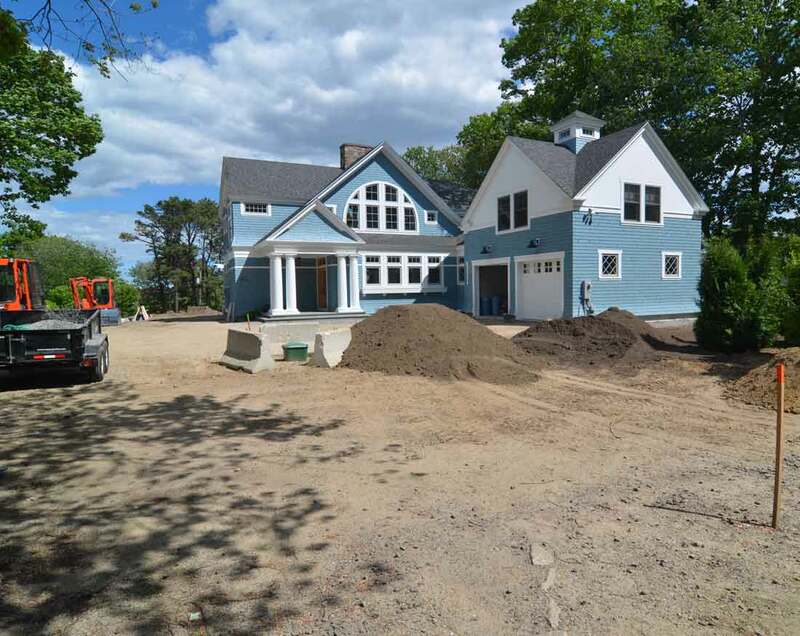 This goal of this project was to integrate a new large, tall house structure into a relatively small and treeless existing site. The client wanted to achieve some privacy from the adjoining roads and did not want a high maintenance property. They also wanted some open space to add annuals and perennials. The photos above show the site with no landscaping. There are some trees on adjoining properties; however, the site is barren of any tree or plant material. As a result, the house looks as if it was placed on the site rather than being an integral part of the site. BEFORE – Site along road before landscaping. AFTER – Site along road after landscaping. The left photo above shows the house during construction, with a road on two sides of the property. 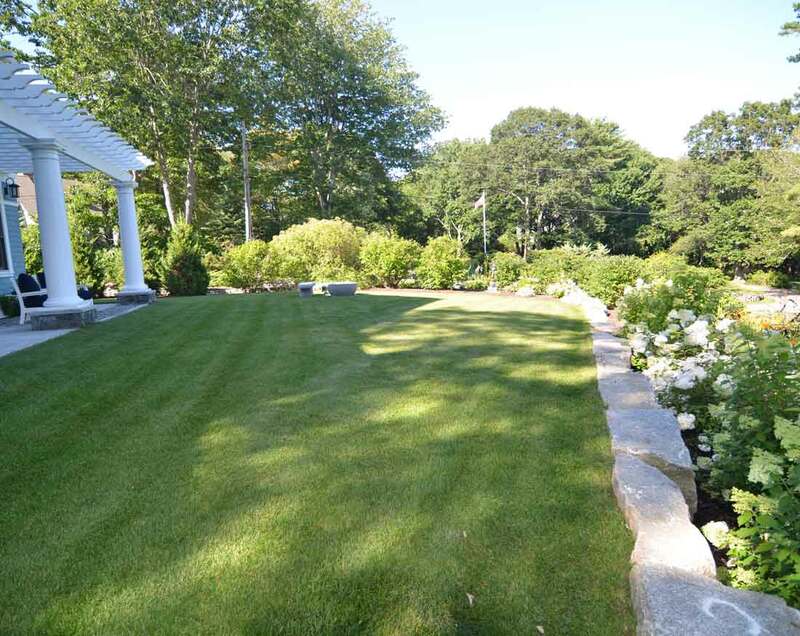 One goal was to provide some privacy, but not create a “wall” of plant material that would block the front entrance. 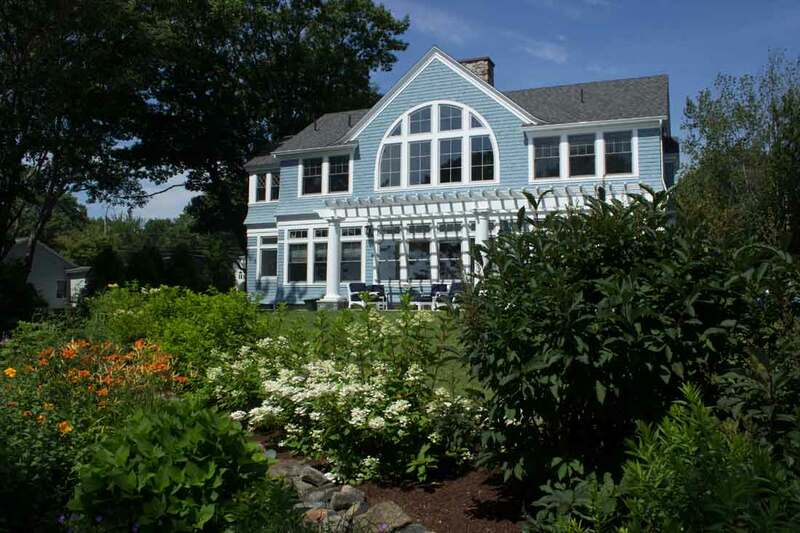 Larger size plant material was used to create a better scale with the house size. 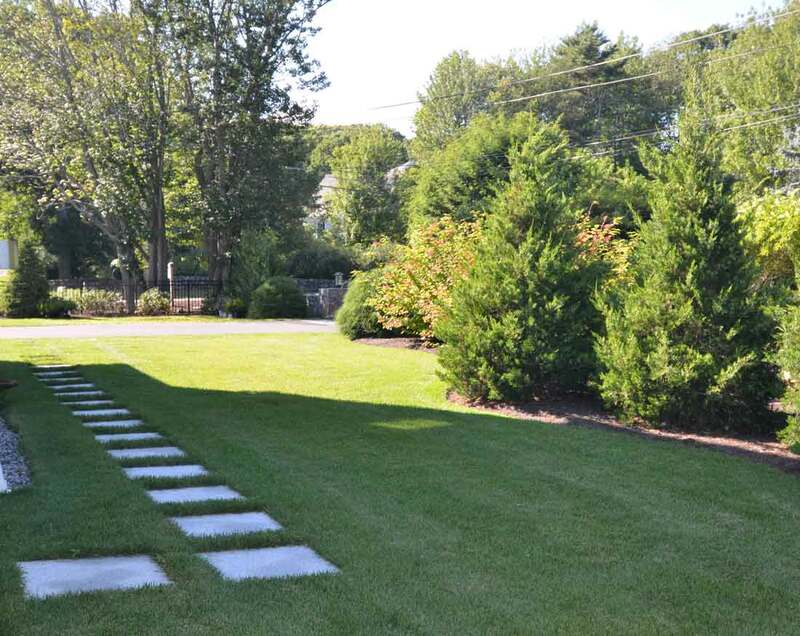 The client also wanted an informal step stone walk to the rear of the property. An extension of an existing wall along the entrance road created a sense of enclosure. BEFORE: Rear of property finish grade over septic system. AFTER: Granite block wall supports grade change for septic system. The left photo above shows the rear of the property at rough grade and start of loaming. The loam was installed at 6-8” due to the existing sand of the rough grade. 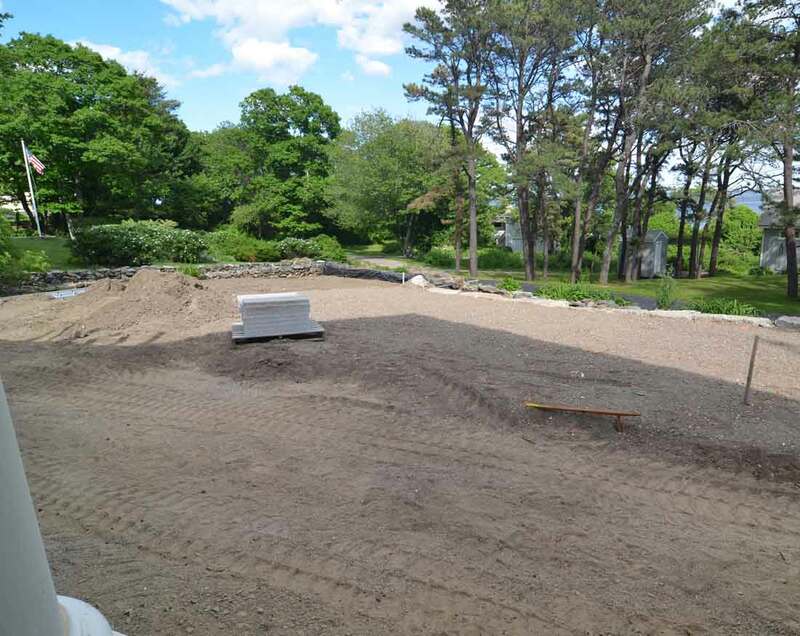 The septic system is located in this area and due to the slope away from the house, we graded to create some even lawn area and then installed large granite blocks to achieve the height necessary to grade over the septic tank. Flowering shrubs were planted along the granite block wall. 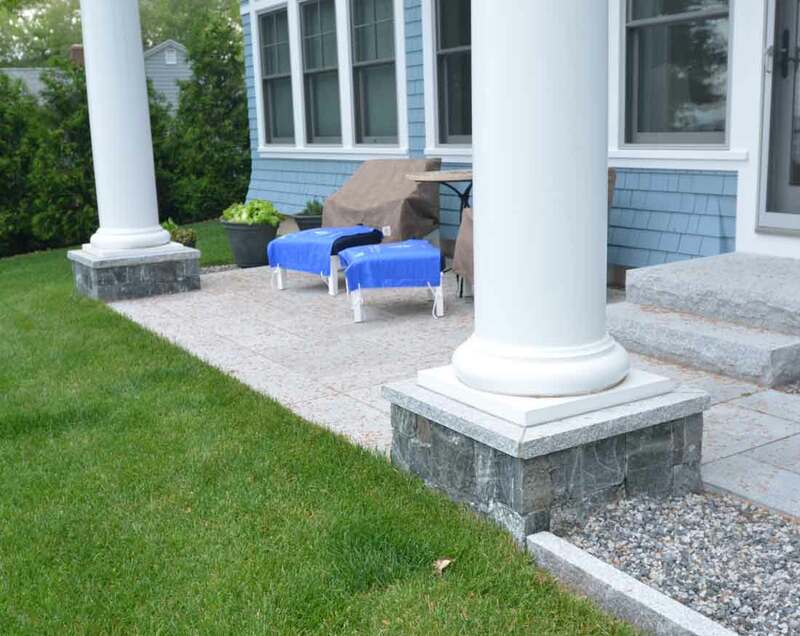 Granite patio with stone veneer on column bases. Cobblestone walkway at front entrance. The town lot coverage zoning for this property restricted the size of the patio in the rear of the house, shown in the left photo. 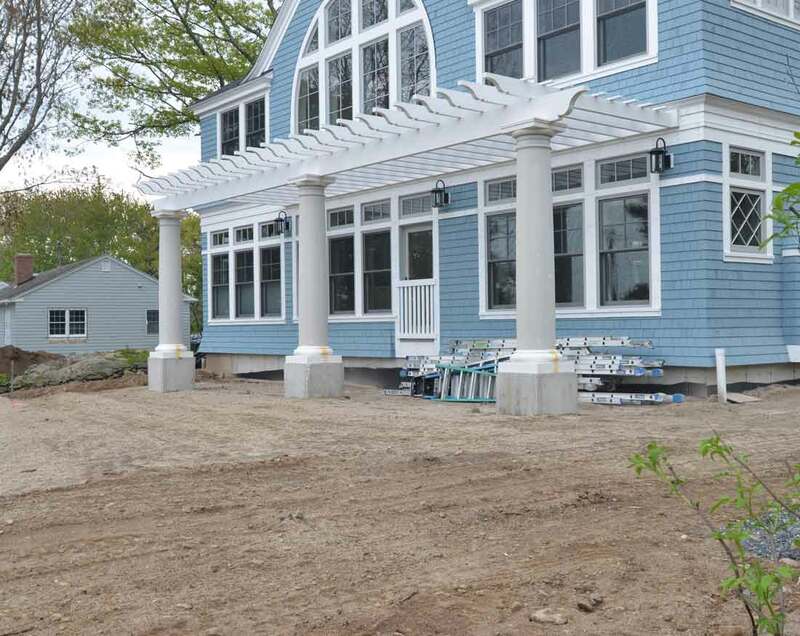 The granite patio was designed to fit in with the column bases which support the pergola. 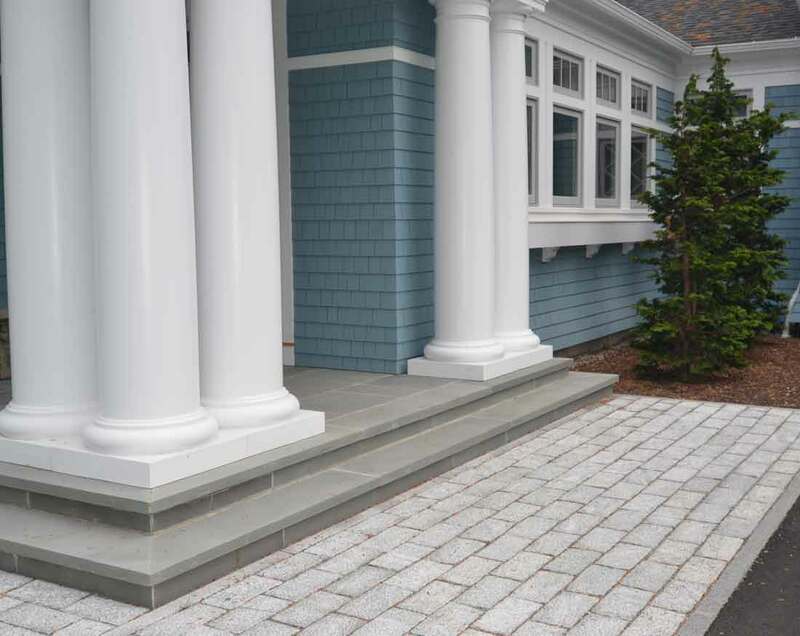 The veneer on the column bases is a gray and blue stone to pick up the gray of the granite and the blue of the house. 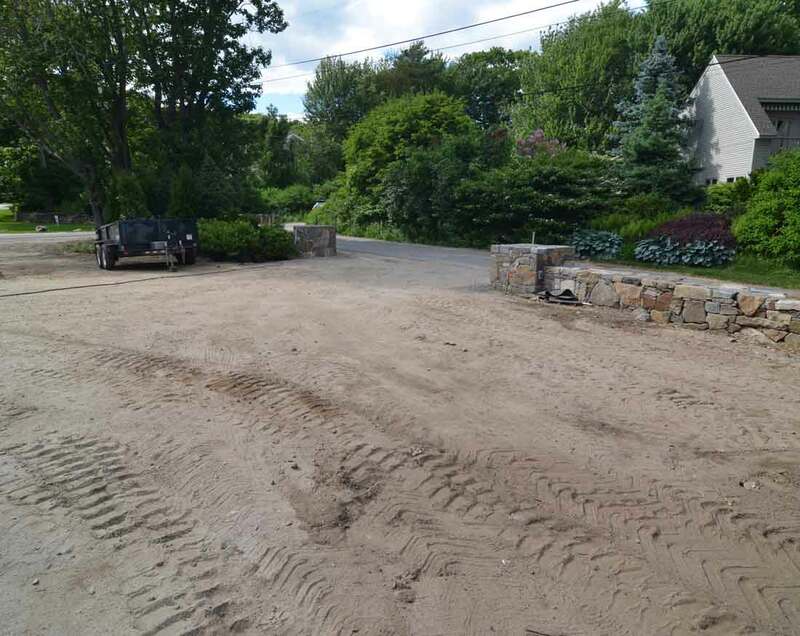 The front entrance, shown in the right photo, utilized a large cobblestone walkway with granite edging to bridge the front steps to the driveway.